"Both sides of the creek?" "Both sides" said the realtor. "So we would own ALL this?" And with those words, several years ago we bought a park. Well, it's not really a park. We bought a piece of property so wild and beautiful that it could be a park. The only vehicle access is by a long gravel and dirt road, and if the weather doesn't cooperate, even that's iffy. This is the land of 4-wheel drive trucks and flexible schedules. Don't get in a hurry up here. This land will teach you patience, but it will also reward anyone who will just slow down and look around. A few weeks ago I was checking fences when I spotted a male painted bunting flying low ahead of me. I slowed the 4-Wheeler to a stop as he landed in the middle of the dirt road - and danced. He fluttered and danced his little heart out. A female bunting landed beside him. "Okay, show me what you've got," she said. So he got his groove on. And boy could he boogie. He could break dance. He could waltz. He could tap. He was a regular Picasso Fred Astaire. And they mated. Right in front of me. I sat there with my mouth open. It was sort of a R rated version of Snow White and the forest animals. When they finally flew off, I found my voice. "Oh wow. Those birds are normally shy but these had absolutely no fear of us." "We should have eaten them when we had the chance." Fortunately I don't take a lot of advice from the Labrador. We drove on down the red dirt road as the misty rain fogged up my glasses. Two male painted buntings darted in the air ahead of us locked in an aerial dogfight. I paused to wipe my glasses clear and watch. I'm not a big fight person anyway, but this was much more interesting than the Mayweather/Pacquiao fight. Eventually one bird gave up and flew away and the other returned to a stand of mesquite trees nearby. 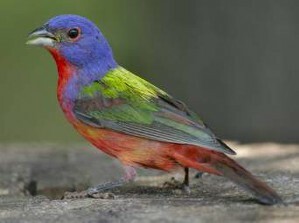 As we drove past the grove, a female painted bunting flew out. That explained the winged martial arts. We are so far off the beaten path that nature has accepted us as just a couple more creatures in the landscape. That is part of the beauty here. It is like living in a state park. It is a blessing, and not one that I take for granted. As the 4wheeler bounced along the trail, I gave it some thought. Just as the family in the movie, "We Bought A Zoo" made some sacrifices and took that leap of faith, so have we. 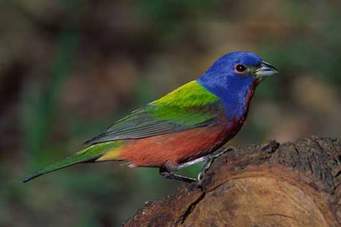 This week as I watched the painted buntings dart ahead of me, and the hawk fly overhead, my heart smiled. City folk plan their vacations around places like this. Not only is the land itself wild and beautiful, but nature is literally on your doorstep. When nature is a rattlesnake in your driveway, sometimes it seems more like Jurassic Park, than Disney World but nevertheless, I recognize that life in this place is a blessing and I look forward to watching the sun rise on each day here. What gorgeous birds. Colouring reminds me of some of the parrots round here. Enjoy your new life. Apparently there are a lot of them on the ranch. I see a lot of buntings, cardinals, mockingbirds, and hawks.